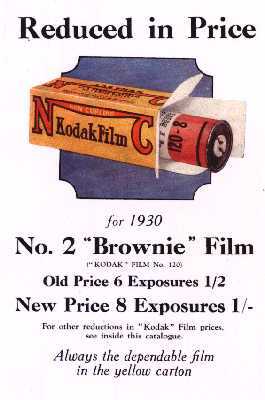 Very many Kodak roll-film cameras, which include Brownies, Hawk-Eyes, Premos etc., incorporate the film-size or negative size within the model name or designation. For cameras like the Six-20 Kodak or the Brownie 127 this is fairly obviously 620 and 127 film respectively. Where it gets a bit more complicated is the allocation of numbers, as in No.2 Brownie or No.3A Autographic Kodak, as these numbers refer to the negative size, not the film size, and to make things even more difficult, a No.1 Kodak takes the same size negative as a No.2 Brownie or Hawk-Eye, usually, (though not necessarily), on the same size film! I have tabulated below the various model numbers used in the different ranges sorted by negative size. These model numbers were used extensively by Kodak until the mid 1930's. Note at this point that a "No.2 Brownie Model C", for instance, is a different camera, taking a different film size, to a "No.2C Brownie". In this case the "Model C" designation being one of a series of "No.2 Brownie" cameras that were manufactured from 1901-1933. An empty entry indicates that that model range did not feature a camera which took negatives of that size. Note that many of the early "Hawk-Eyes" and "Weno Hawk-Eyes" used a different numbering sequence, as did the very early Kodak box-type cameras, such as the No.2 Bulls-Eye Kodak, also that film-pack cameras such as the No.2 Film Pack Hawk-Eye and the Premo Junior No.1 obviously did not take roll-film. There are references on my links page to possible suppliers of obsolete film. Note that the size 126 roll-film as used in a No.4A Kodak has no relationship to the 126 Kodapak film cartridge as used in the cartridge-loading Instamatics.